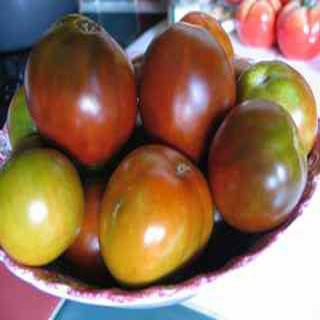 These "brown" tomato seeds produce 6-8 ounce fruit; deep russet- brown with light and dark chartreuse shoulders. Very juicy and tart; these have more of a bite than the purple varieties. Boy, am I loving these "brown" tomatoes! 6-8 ounce, deep russet- brown with light and dark chartreuse shoulders. Very juicy and tart; these have more of a bite than the purple varieties. Sort of oblong little globes; they are a nice size for the kitchen, or snacking. These cute chocolate brown's are sure to please!